20 miles on the PRT and DDMR. 36 degrees to start with a little bit of snow falling....then it zoomed up to about 48 degrees and go pretty sunny. 50 days till the Greatest Running Show on earth!!!!! 20 miles in the PTR & DDMR. Start @40 degrees, end 52 degrees. Clear sunny skies with a light breeze. 43 days till I run from Hopkinton to Boston at the 119th running of the Boston Marathon. 8 miles on the DDMR @ 3:30am....light rain, 48 degrees, light breeze. Cool, calm and quiet. 39 days till Boston. 9 miles on the DDMR at noon today. 52 degrees, clear and sunny skies......nice running conditions. 11 easy training miles this am. 52 degrees, clean & clear at zero dark 30.....34 days till the plan comes to fruition....at Boston! 7 miles @ 3:30am, 38 degrees, lt wind, no rain, dark and early! 6 miles on the DDMR.........Hey, 30 days till the Boston! 6 easy miles on the DDMR. 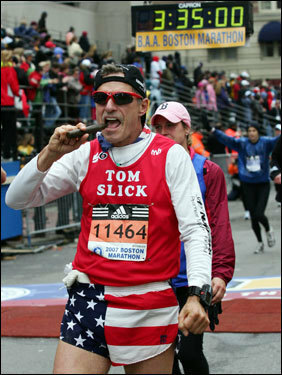 whoops, lost track of how many days till Boston....still 30 days away. I wonder how much snow will be on the ground on Marathon Monday? I wonder if my people will be out in force at the Biker Bar at the 2 mile mark???? Started out to do 20 miles but ended with 17 miles on the PTR. 65 degrees, 15 to 20 mph wind, partly cloudy, and I've only got 2 more pounds to lose before the Boston Marathon in 29 days and I will have hit my goal (160) weight. Yea!!!! 6 mi on the DDMR w/Missie. 54 degrees, light breeze,and a couple of sprinkles, @ zero dark thirty.... 28 days till Boston. 6 mi on the DDMR w/Missie. Zero Dark Thirty AM, 38 degrees, wet road from rain earlier this night, clean, clear and crisp.....great run. 26 days till we all toe the line at BOSTON! 8 mi on the DDMR, 52 degrees, light breeze, clear skies, 48% Humidity. 23 short days till The Boston. 18 mi on the PRT, 47 degrees, 53% humidity, semi dark, lite breeze. Ok, it's official- I'm in taper madness and there are only 22 days left till the 119th running of The Boston 2015. 8 mi on the DDMR & SHP. 50 degrees am, 23% humidity, dark and cool. 20 days until New England Calm Chowder, Sam Adams Boston Brew, A Red Sox game with a Fenway Frank, and a 26.2 miler from Hopkinton to Boston......Yea! "Life doesn't get any better than this!"